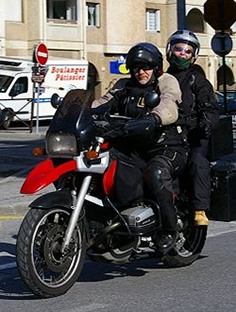 FEMA the Federation Of European Motorcyclists’ Associations who represent the members of 24 national motorcyclists’ organisations from 19 European countries have announce the date of their 2011 MEP Ride. 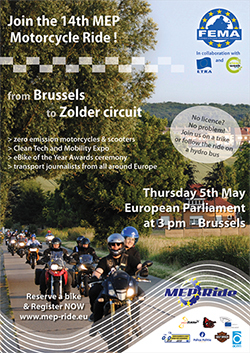 The 14th MEP Ride will be organised on May 5th 2011 and will start in Brussels Belgium riding to the racetrack, Circuit Zolder in Flanders to open the Clean Week of Zolder. The Clean Week of Zolder has been announced officially as Energy Days of the European Commission’s Sustainable Energy Europe Campaign. Clean Week 2020 is listed among the projects supported by the Commission’s Sustainable Energy Europe Campaign. Motorcycles will be provided for MEPs and their assistants. Of course you can also join on your own motorcycle. Helmets and clothing will be available. 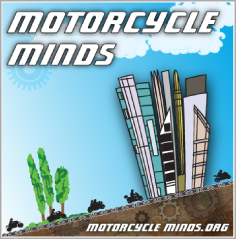 The concept of the MEP Ride is to bring together motorcycling citizens from all over Europe and their elected representatives for an informal and enjoyable event, giving MEPs the opportunity to experience the pleasure of motorcycling, while at the same time better understand motorcycle related issues. In Zolder, all important elecric motorcycles and scooters will be present for testing. At the same time Quantya, Vectric, ZERO Motorcyles et. al. are competing for the eBike of the Year award. The editors in chief of all important motorcycle magazines in Europe will announce the winner eBikes in Zolder. Participants of the MEP Ride will have the change to join the lap of honour on an eBike on the race track after the awards ceremony. The MEP Ride will also go for 2 laps on the Circuit. An exposition tent will show the latest developments in the field of green mobility. All well known manufacturers from BMW to Yamaha have confirmed to support the MEP Ride with motorcycles, trikes and scooters again. There will be the opportunity to test Motorcycles, scooters as well as electric models can be tested. Make sure you register in time and reserve your preferred model for this years MEP Ride from Brussels to Zolder on May 5th!